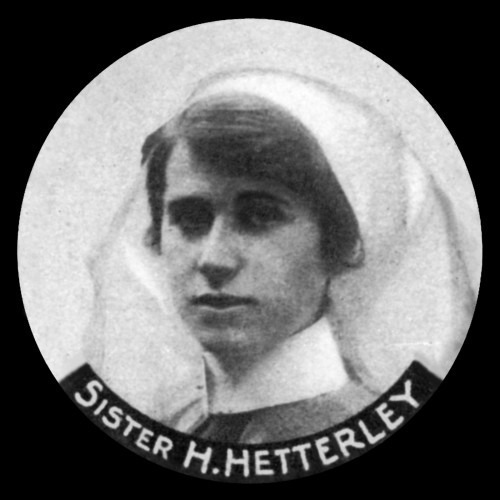 Helen and Joseph Hetterley from Oakham were cousins. They both died in the First World War, and both were aged just 26 years old. Their fathers, George and William were the eldest two brothers of Joseph and Charlotte Hetterley and just a year apart in age. William named his son Joseph after his father, George gave Helen “Charlotte” as her middle name after his mother. William and George grew up in Manton but moved to Oakham after they married. William had ten children (three died at a young age), George had twelve (again three died at a young age). Helen was a nurse based at Canterbury treating injured soldiers during the war – she caught tuberculosis from which she died. She is buried in Oakham Cemetery in the Hetterley family plot. She shares a grave with her three young siblings who died in childhood. Joseph enlisted in March 1915 and fought at Ypres. Within four months he had been killed and is buried on the Western Front. Helen and Joseph weren’t the only two to serve during the First World War. Helen’s younger brother Charles enlisted in 1914 at the age of just 14 years and 4 months. He joined the 3rd Battalion, Leicestershire Regiment. Joseph’s elder brother George, and younger brother Cecil also both fought. George enlisted at the age of 32 in September 1914 shortly after the war began and joined the 1st Battalion, Leicestershire Regiment. Cecil also enlisted although details as to his war record are not known. George, Cecil and Charles all survived, and Charles emigrated to Canada after the war.